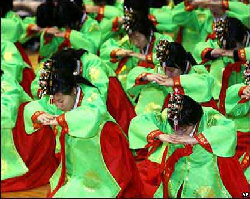 South Korea Culture revolves around the traditional clothing. dance and of course Korean music, be it traditional or the modern day kpop. While South Korea is modernizing at a runaway speed, its traditions and customs are still remnants of past beliefs. For five hundred years Confucianism was not only the major religion of South Korea, but permeated every aspect of life. Even though much of the country now professes no religious following and the vast majority of those who do subscribe to a faith follow either Christianity or Buddhism, the principles of honor and respect are still the legacy of Confucianism. With that in mind the customs associated with greetings in South Korea culture are often linked with status. In social situations, it is proper to wait to be introduced. The lower status person is expected to bow before the person of higher status. This can be followed by a handshake, which is often included as an act of difference to the culture of a visitor, but should be offered by the person of higher status.Having bowed to show respect, it is customary to say,"Man-na-suh Pan-gop-sumnida" which effectively means "Pleased to meet you." When visiting a home, South Korea culture would demand that a small gift is offered to the hosts. Elaborate or expensive gifts are frowned upon as it is anticipated that the gift will be reciprocated; flowers, fruit or good quality chocolates are ideal. It is also expected that gifts will be wrapped and to this end it is important to use the colors red and yellow, which depict royalty; pink is an acceptable variation as it, with yellow, is the color of happiness, but avoid green, white or black paper. If writing the name of a person in South Korea, never use red as this denotes that the person is dead. Furthermore, it is important to be aware of the significance of numbers in South Korea society. Seven is considered lucky and so seven pieces of fruit or seven flowers would be a welcomed gift. Similarly, four should be avoided, as should any multiple of four and twenty-eight is just confusing. Tipping is not required in most circumstances in South Korea. The rare exceptions relate to taxi drivers when they help with luggage or when they drive passengers to the airport. In these cases, a tip of ten per cent of the fare is recommended. In keeping with the speed of the country's progress, attire has become more relaxed and only simple vestiges of a conservative past remain. Especially in business, the dark and subdued colors are expected for both men and women, but more notably, men should avoid jewelry beyond a watch and a wedding ring. 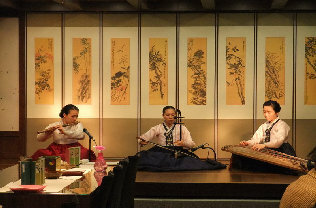 In South Korea Culture, when dining, know that the art of drinking Green Tea dates back as far as the 9th AD and one eats with chopsticks and spoon. Unlike some Asian countries, it is considered poor manners to eat rice with chopsticks, as it is to lift dishes from the table while eating. Chopstick should be used for larger pieces of food, never used to pierce food and replaced on the chopstick rest after every few uses, when speaking or taking a drink. It should be expected that the most senior person, by age or status, will be served first and others will not begin eating until this person has begun. While it may seem inconsequential, South Korea culture of completing meals, meetings and social occasions that are worth keeping in mind. Chopsticks never be left crossed or laying across a bowl; a spoon should never be left in a bowl as this is the traditional setting for passed ancestors. Finally, in leaving any social occasion, it is important to be sure to bow and bid farewell to each person individually.